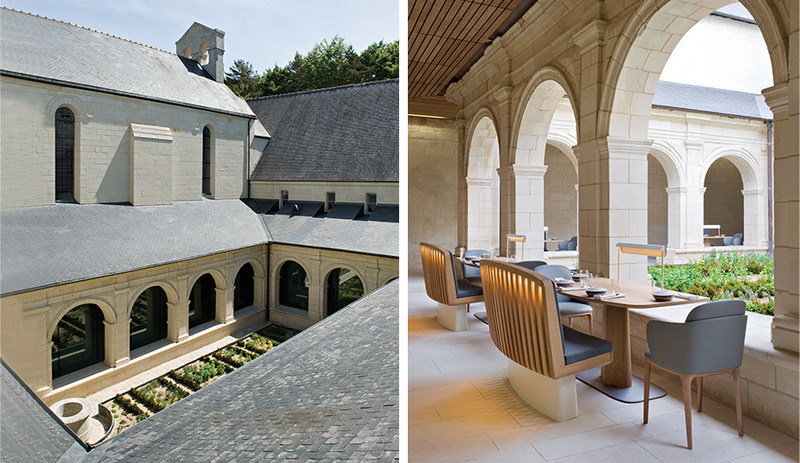 Left: Herbs grown in the abbey’s cloister fortify a kitchen run by award-winning chef Thibaut Ruggeri. 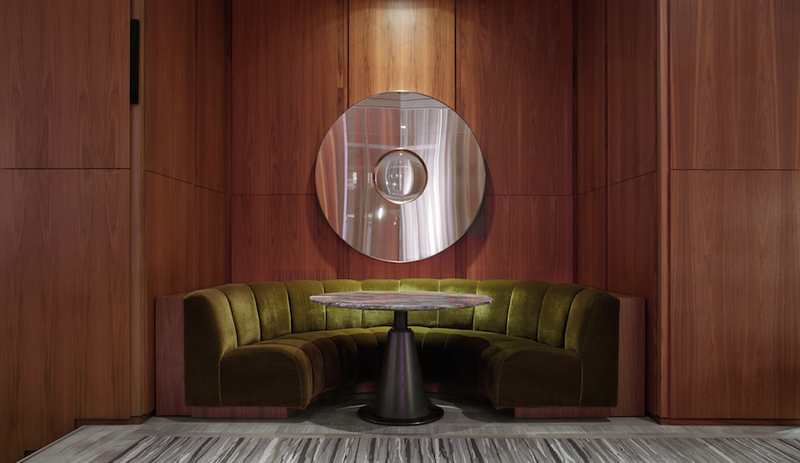 Right: Custom benches with inset lighting furnish intimate tables for four. The chapel is a main meeting spot, with a row of banquettes running down the nave. 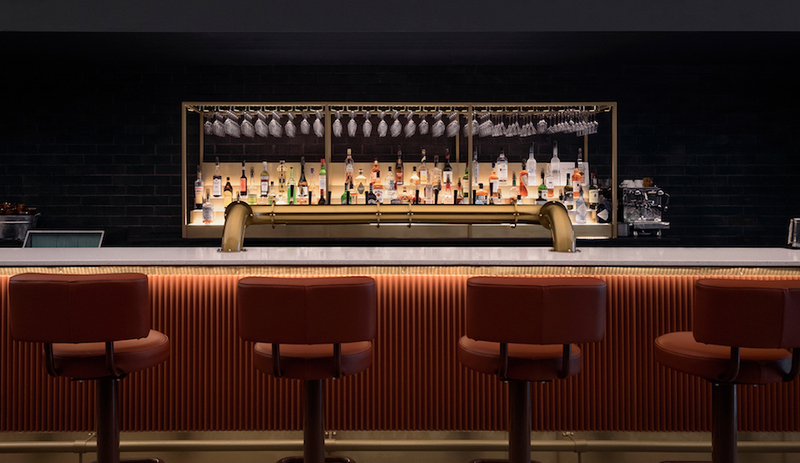 Anyone familiar with Jouin Manku, the highly experimental studio run by product designer Patrick Jouin and architect Sanjit Manku, might be tempted to box the Paris firm’s work in to the realm of luxury retail and hospitality: the restaurants of Chef Alain Ducasse, Van Cleef & Arpels boutiques – all boast sumptuous, sleek interiors. 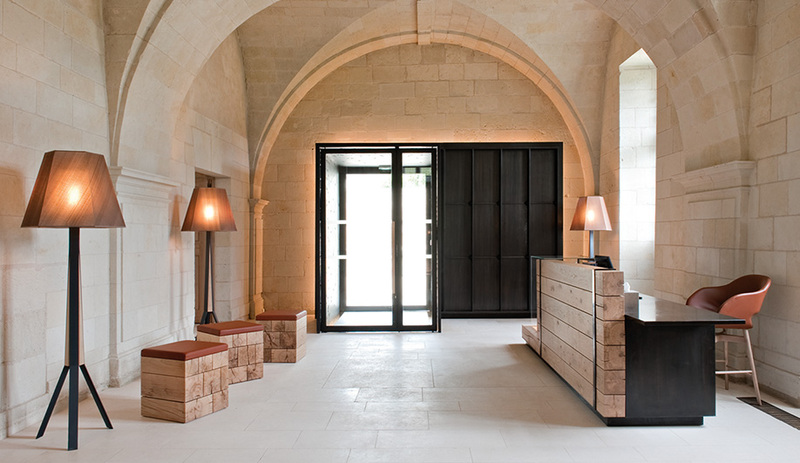 Then there is Fontevraud L’Hôtel in the Loire Valley, where a storied past has helped to shape a contemporary vision, one that balances an austere way of life with all of the modern conveniences. 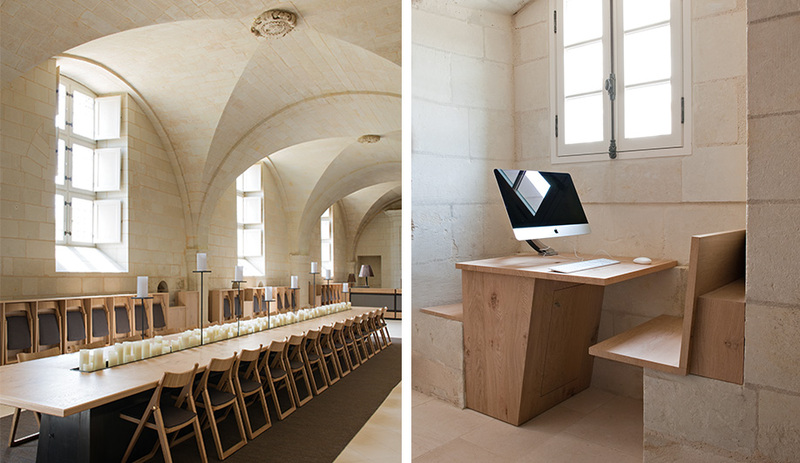 Erected during the 12th century as the Saint-Lazare priory, the hotel stands as one of four buildings within the Fontevraud Abbey, a UNESCO World Heritage Site and one of the largest preserved monasteries in France. The entire compound spreads across 13 hectares, with most of the property occupied by the Fontevraud Royal Abbey (King Henry II of England was buried there over 800 years ago). The region has been a long-time tourist destination, given the numerous châteaux and vineyards, many of which have produced wine since the first century AD. Left: a modular island in the ibar features various seating configurations and touch screen tabletops. Right: custom furnishings and a palette of neu­tral tones har­monize the design. Jouin explains that the monks’ efficient way of life informed the design. In the former refectory, a custom oak table extends for eight metres and accommodates 30 or more guests, who are expected to sit up straight (not unlike monks) in folding wooden chairs. When not in use, the chairs nest in an orderly fashion along the walls within LED-lit frames, which also serve to hide heating and wiring. A metal and glass foyer leads to the reception area. According to Manku, the architects benefited from a freedom seldom granted to projects of this scale. Describing their approach as “monk tech,” Manku singles out the iBar as an example. 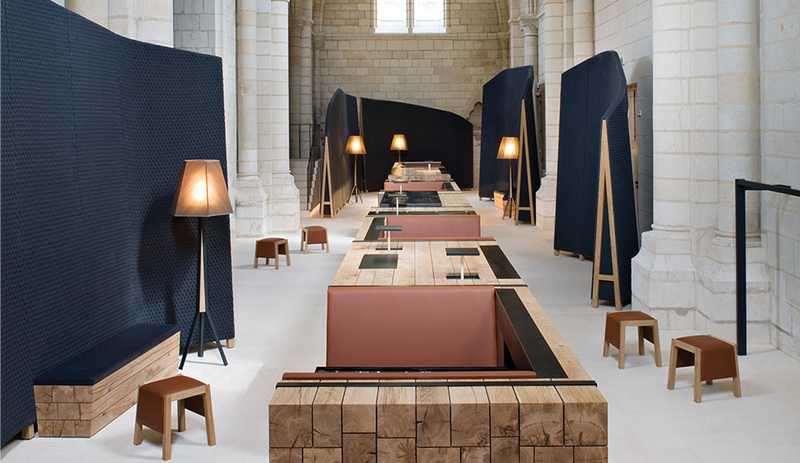 A bold and boxy island of four-seater banquettes made from salvaged oak beams runs the length of the chapel, and the tabletops are embedded with touch screen pads. While the screens can always be powered off, it seems counterintuitive to stay in one of the world’s oldest monasteries, with its ornate cloisters and towering arches, only to discover that you can play virtual games in the hotel’s main gathering place. 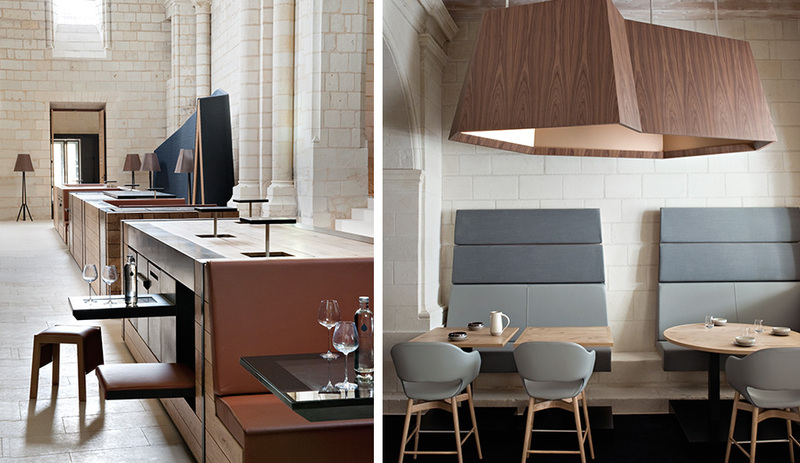 Left: an oak table sur­rounded by fold­ing chairs was inspired by the history of the monastery, which once lodged 1,000 monks and nuns. Right: additional elements had to be inserted without damaging the heritage site. Upon check-in, guests are handed iPads loaded with multimedia content and services (the hotel calls this Hospitality 2.0). 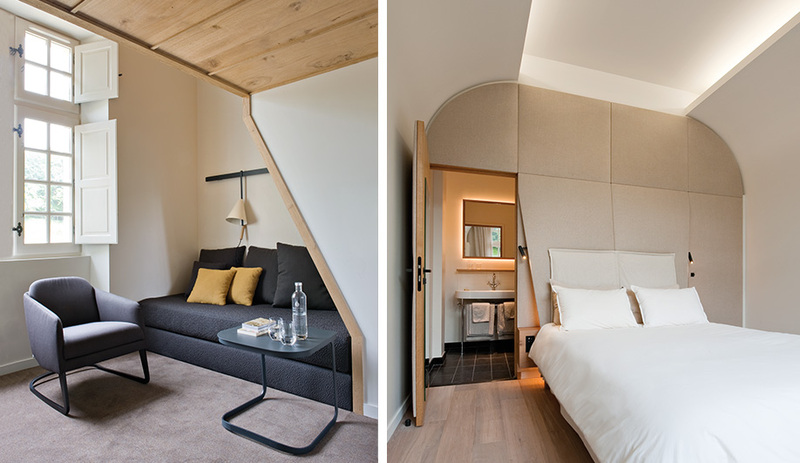 They are then led to their rooms, with the comforts of fabric-lined walls, linen headboards and custom-made mattresses, while flat-screen TVs are secreted behind perforated metal panels. 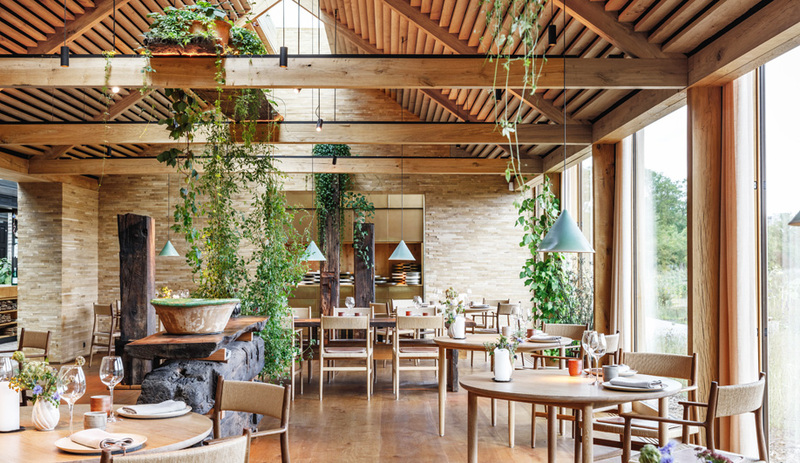 The 88-seat restaurant contains two distinct areas, including open-air tables that face outward from the cloister to a courtyard filled with fragrant herbs. 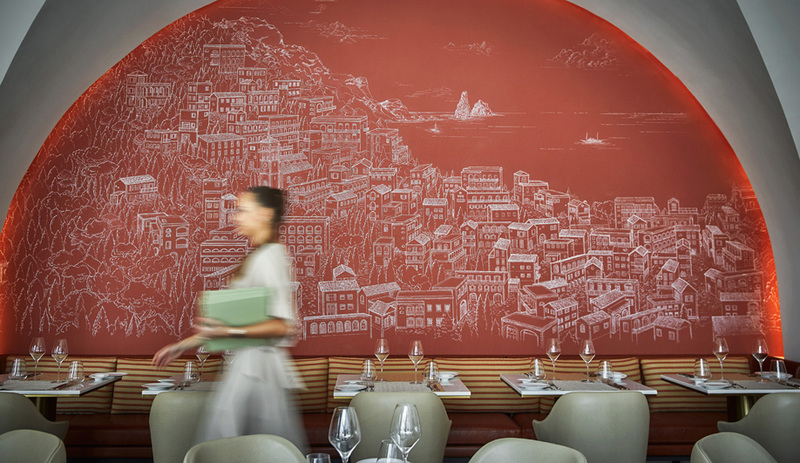 Award-winning chef Thibaut Ruggeri uses the garden’s bounty to prepare a heavenly menu stocked with local meats and cheese dishes, often garnished with honey from the hotel’s hives – all served on dishware crafted by a ceramicist who lives just down road.